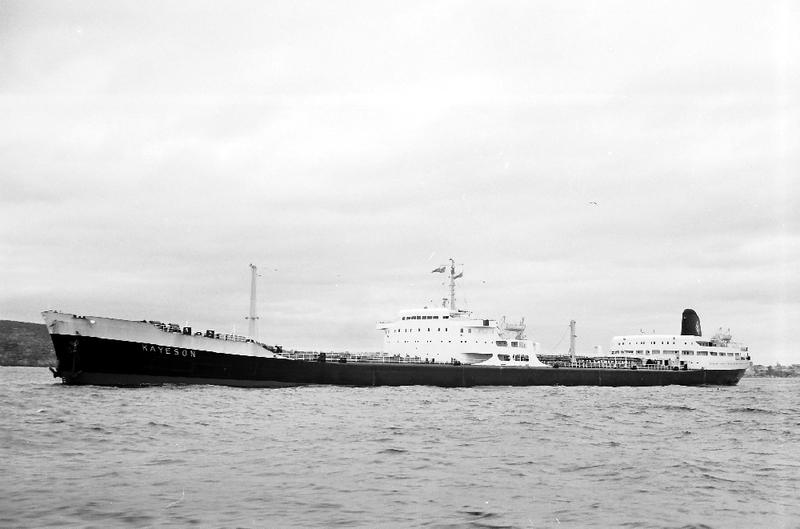 Completed 1961 as Kayeson for Kaye Tanker Management. In 20 year time-charter for STUK. 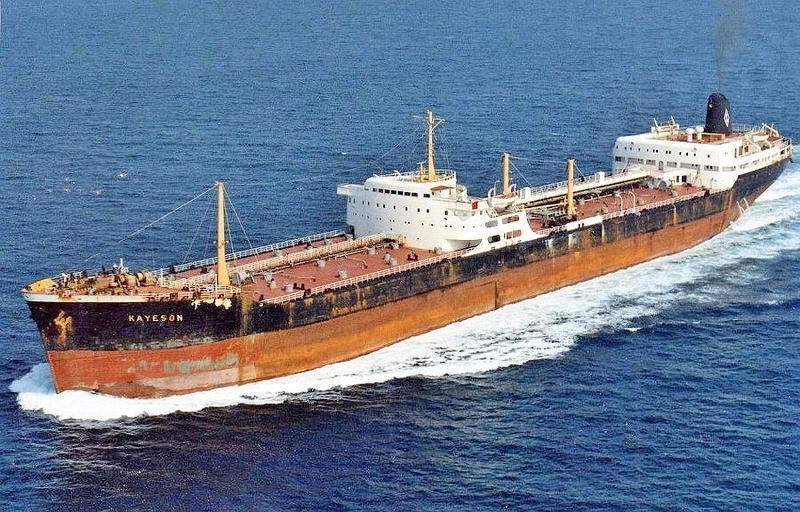 1981 sold and renamed Aounallah. 1983 scrapped Karachi. Anglo-Saxon / Shell Tankers U.K. I was 4th. & 3rd. eng.in 1969.Due to the incompetence of a certain watchkeeper the entire stock of distilled water was contaminated and had to be bilged (45 tons).Weloaded a high wax cargo of crude in Miri for San Francisco. This required cargo heating because it solidies at ambient temp.Cargo heating results in a lot of distilled water losses, but we were just about able hold our own.Then the fwd evap. broke down and needed repair.The cargo heating could not be shut down because the cargo would have solidified.We had one distilled water tank with about 1 or 2 tons slopping about inthe bottom, when it disappeared out of the sightglass the watchkeeper would slow the main engine until water reappeared in the glass.We somehow made it to S.F.by the skin of our teeth.I was never so happy to be paid off in San francisco and fly home.Kayeson was a floating wreck that haunts me to this day. I was on the Kayeson for six and a half months from 1962 to 1963 mainly on the Thames Haven to Kuwait run, also Tunisia and Rotterdam. Whilst in Port de Bouc, near Marseille we had a run ashore (as one does). The next morning we heard that the bosun had been found dead in the dock,by the ship. The word was that he was returning to the ship perhaps the worse for wear for drink when he was beaten up by the local Gendarmes. The next night some of the crew took it upon themselves to go ashore and cause a bit of bother. As a result all shore leave was stopped and apparently we were banned from entering France again (I have been back many times over the years). I can't put an exact date on this incident but I think it would be early 1963. If anyone can verify this or add to the story I would be grateful. Have you sailed on Kayeson? Log in and add yourself as a sailor to the Kayeson! Log in and add your personal story to the Kayeson!